Wayne Ross McElroy, 87, of Paducah, died Tuesday, June 19, 2018 at Baptist Health-Paducah. Wayne was born in Nevada, Missouri on July 6, 1930 to Floyd Alvis McElroy and Eunice Wanita (Bunn) McElroy. Wayne spent his entire life being involved in the education and encouragement of young people. He began his own education at Ottawa University, Ottawa, Kansas. Wayne was pulled away to serve in the United States Army, where he played football, participated in band and was a clerk. He eventually received his Ed.D from University of Arkansas, Fayetteville, AR. Wayne coached many sports before his career turned to administration. High school sports were his passion. He held season tickets to Paducah Tilghman High School football and basketball and enjoyed watching all of his grandchildren perform and compete, sometimes even attending their practice sessions. Professionally, Wayne was a professor at Southeast Missouri University, Cape Girardeau, MO; President of Fort Scott Community College, Ft. Scott, KS; principal at North County High School, Desloge, MO; and after he retired, supervised student teachers for Murray State University, Murray, KY.
Wayne was devoted to First Baptist Church-Paducah, where he served as deacon and teacher. 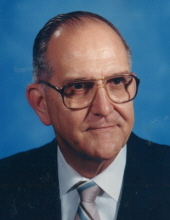 He was a longtime member of Gideons International and Rotary International. Surviving are his wife, Sue Richards McElroy to whom he was married for 63 years; sons, Dr. Bradley Burton (Brenda) McElroy of Paducah and Brian Wayne (Carmen) McElroy of Lees Summit, MO; son-in-law, Tom Cantwell of Paducah; grandchildren, Scott Thomas (Emily) McElroy, Elizabeth Anne (Matt) Hill, Kristen Kaye (Connor) Ojard, Allison Leigh (Brandon) Perry, Thomas Hunter (Emily) Cantwell, Meri Brooke (Jordan) Colburn, Megan Elizabeth Cantwell, Sara May McElroy, Davis Paul McElroy, and Daniel Wayne McElroy; great-grandchildren, Caroline Campbell Hill, Henry McElroy Hill, Georgia Reed Hill, Charlotte Grace Cantwell, Gabriel Baron Cantwell, Anna James Ojard, Emerson Kate Ojard, Grant Thomas Colburn, and Ella Scott McElroy; and sister, Patricia Alice Elder of Montevallo, Alabama. He was preceded in death by his daughter, Brenda Sue Cantwell and his parents. Visitation will begin at 10am Friday, June 22, 2018 at First Baptist Church-Paducah. Funeral services will follow at 1pm with Dr. Charles Moore and Rev. Tommy Tucker officiating. Burial will follow at Brooks Memorial Park. Contributions may be made to First Baptist Church-Paducah, 2890 Broadway, Paducah, KY 42001. You may leave a message of sympathy or light a memorial candle at www.milnerandorr.com. To send flowers or a remembrance gift to the family of Wayne "Mac" McElroy, please visit our Tribute Store. "Email Address" would like to share the life celebration of Wayne "Mac" McElroy. Click on the "link" to go to share a favorite memory or leave a condolence message for the family.